It's time you learned of the fiendish, diabolical torture NOW being planned in the name religion. YOU are among its intended victims! Here's the truth! IMAGINE — if you can — a time when millions of Christians in the United States and Britain will be MARTYRED — and that within the next 16 years! Imagine — if you can — decrees being issued by a foreign government — not even as yet in existence — pronouncing the death sentence upon good and upright and sincere people for no other crime than believing in the plain Word of God — and holding fast the commands of Jesus Christ. Such an eventuality in this 20th century seems absurd — impossible! Is not this the most enlightened age humanity has ever witnessed? WHO would ever want to martyr Christians again? Yet such an eventuality IS PROPHESIED! Most people in our Western English-speaking world know little about what really goes on behind the Iron Curtain. But it is time you KNEW! I have before me the official English translation of "THE CRIMES OF THE STALIN ERA," by Nikita Khrushchev, the present Russian dictator. It is a shocking report — an unbelievable account of the seizure, torture and brutal murder of tens of millions of people! It is almost unbelievable — but it is true (except for the fact that Khrushchev does not admit his part in the same crimes)! And this mass torture and mass murder has occurred in this "enlightened" twentieth century! NEVER IN THE HISTORY OF THE WORLD HAVE SO MANY PEOPLE BEEN TORTURED AND MURDERED IN SUCH A FEW SHORT YEARS! This policy of torture by fiendish atheistic communism has now spread to China. Latest reports prove that China's communist regime, in its effort to stamp out freedom and religion, are murdering frightened Chinese peasants even faster than Stalin was ever able to. And have we so soon forgotten the scientific, diabolical tortures — illustrated in this article — which were perpetrated by the Nazis against the Jews in the concentration camps and against the slave — laborers? Why can't we wake up to see that the cruel tortures of the Middle Ages are again sweeping the world — only 1000 times more terrible! The handwriting for America and Britain is on the wall NOW! In less than 16 years it will be TOO LATE! It is time you understand NOW — before it is too late for YOU — what is prophesied to happen. YOU are among the intended victims of the most terrible time of torture and tribulation that will ever occur on earth! It is being planned now, secretly, undercover! For over a thousand years — during the Dark and Middle Ages — faithful, obedient Christians were martyred by the State in the name of religion. That was the first MARTYRDOM. Notice the prophecy about that martyrdom — a prophecy written centuries before it occurred. It is pictured symbolically in Rev. 6:9-11. The apostle John records, "And when He (Christ) had opened the fifth seal" — a seal covered part of the book which Jesus had iii His hand, aid in that book this prophecy was originally written — " I," John continues, "saw under the altar" — the altar by the throne of God in heaven where John, in vision while on the Isle of Patmos, saw the events prophesied in Revelation symbolically occur — notice: "I saw... the souls of them that were martyred for the Word of God, and for the testimony which they held: And they cried with a loud voice" — symbolically, in this vision — "saying, 'How long, 0 Lord, holy and true, dost Thou not judge and avenge our blood on them that dwell on the earth?'... And it was said unto them, that they" — who were martyred during the Dark and Middle Ages for obeying the Word of God — "that they should rest yet for a little season, UNTIL THEIR FELLOW SERVANTS ALSO AND THEIR BRETHREN, THAT SHOULD BE KILLED AS THEY WERE, SHOULD BE FULFILLED." Here is a prophecy for our day! There has never been a martyrdom of millions of true, obedient, faithful Christians since the Middle Ages. Yet here is a prophecy of another martyrdom — yet to occur — in which millions more would he killed AS THEY WERE IN THE MIDDLE AGES! John saw, in vision, those martyrs who WERE slain. They are now long dead. They were killed "for the Word of God, and for the testimony" — the gospel message of the rule, the Kingdom of God — "which they held." They were put to death for no greater crime than believing THE BIBLE and holding fast to the TESTIMONY OF JESUS CHRIST, written and recorded in the Bible. History records their marryrdom. At least fifty million were martyred within the Holy Roman Empire and adjoining nations. In the name of religion they were declared "anathema from Christ" — accursed of Christ, heretics — and were given the death sentence, after which the State executed them. But notice what is said, in vision, to those dead martyrs: "They should rest yet for a little season, UNTIL" — what? — "their fellowservants also and their brethren... should be killed as they were!" Another martyrdom! And notice, this coming martyrdom will be like the previous one — only 1000 times more terrible in intensity. 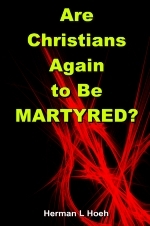 Christians living today are to be martyred "as their brethren were" in past ages. They are to be put to death in the name of religion, but the State will be the power that actually kills them. Remember what Jesus said? "Yea, the hour cometh, that whoever killeth you shall think that he offereth service to God. And these things will they do... " (John 16:2-3). This is not a martyrdom by atheistic communists. They do not even believe God exists. They murder their enemies for the sake of the Communist Party, not because they think they are serving God! BUT THE COMING MARTYRDOM OF CHRISTIANS WILL BE A RELIGIOUS PERSECUTION! It will be done as a supposed act of service to God! Deceived people, professing Christianity, murdering faithful Christians whom they call "heretics." This is the persecution that's prophesied! "Now go, write it before the people on a tablet, and inscribe it in a book, that it may be for the time to come for ever and ever" — for our day as an everlasting witness — "For it is a rebellious people, lying children, children that refuse to hear the LAW of the Lord; that say to the [ministers): 'Prophesy not unto us right things, speak unto us smooth things, prophesy DELUSIONS" (Isaiah 30:8-10). The MANY are deceived. Satan, the invisible spirit ruler of this present age has HIS MINISTERS IN THE PULPITS masquerading as the ministers of Jesus Christ (II Cor. 11:14): "His ministers also fashion themselves as ministers of righteousness." They pose as the ministers of Jesus Christ, but they are unwittingly the ministers of Satan the devil who is the real author of religious persecution — the real instigator of the COMING GREAT TRIBULATION. Notice, in Revelation 12:9, that Satan "deceiveth the whole world." He has his human agencies on earth — religious and political — that have "deceived all nations" (Rev. 17:2 and 18:3). Satan's false ministers will, "if it were possible, DECEIVE THE VERY ELECT" (Mat. 24:24). Satan's work is a labor of deception! The VERY ELECT, who constantly cry out to God for help day and night in prayer, are the only ones whom Satan has been unable to deceive. He hates them. He persecutes them, not directly, but through human agencies — especially through the instrumentality of religion. In Revelation 12:12, we read: "The devil is gone down unto you, having GREAT WRATH because he knoweth that he hath but a short time." Satan is furious. Six thousand years of deception are about up! He knows his time is now very short. He has great wrath — against whom? "The dragon was wroth with the woman [a symbol of the true Church of God] and went to make war with the remnant of her seed, WHICH KEEP THE COMMANDMENTS OF GOD, and have the TESTIMONY OF JESUS CHRIST" — the true gospel (Rev. 12:17). And notice the human agency which persecutes the martyrs of Jesus Christ: "I saw," wrote John, "the woman drunk with the blood of the saints, and with the blood of the witnesses of Jesus" (Rev. 17:6). This is another woman, a fallen woman, a great harlot or whore. This is an apostate Church — a woman in Scripture is the symbol of a church (II Cor. 11:2). It is a religious power which has relationship with "the kings of the earth" — which "reigns over the kings of the earth" and uses them as her tools (Rev. 17:2, 18). This false religious power refuses to OBEY THE COMMANDMENTS. It goes about to establish its own righteousness. It becomes infuriated, suffers from a feeling of self-condemnation, when it sees the righteousness of God manifested in the true Church. It resorts to persecution in order to destroy the righteous. It uses religion as a deceptive cloak. It deceives itself into believing it serves God by persecuting, torturing and sentencing to death those who OBEY God. The whole western world is being deceived by Satan with a pretense of religion. People want to think themselves righteous, when they are not. Satan is going to stir up this religious guilt — complex into another GREAT MARTYRDOM of saints, called prophetically in Scripture "The Great Tribulation" (Rev. 7:14). This coining horrifying tribulation is now being plotted in secret, underground, by a fascist Babylonish religious political system — the same powers which have always persecuted the faithful Christians! True Christians are yet to be martyred "as they were" during the Dark and Middle Ages. The Tribulation Is the Next Prophesied Event! Jesus has given us the time sequence of events which lead up to the GREAT TRIBULATION. This sequence you will find in Matthew 24, Mark 13 and Luke 21. These three chapters, as we have explained in The PLAIN TRUTH before, contain the order of events at the close of this age. Following false teachers, proclaiming a false gospel — though coming in the name of Christ, saying that Jesus is the Christ — would be wars, famines and pestilences — occurring in that order. These events have already once been fulfilled and already culminated in the tribulation of the Middle Ages. That fulfillment was merely the forerunner of the PRESENT FULFILLMENT — the present host of false teachers, proclaiming false gospels — the present series of wars and rumors of wars inspired by Communist intrigue — the present spread of drought in America, Russia, China and elsewhere which will soon lead to famines and disease epidemics of devastating proportions. Then what comes next — amid this world-wide suffering and hatred against the English-speaking world and against true Christians in particular? "And ye shall hear of wars and rumors of wars... and famines shall be and earthquakes in divers places... THEN" — the very next event — "shall they deliver you up unto TRIBULATION, and shall kill you: and ye shall be hated of all nations for my name's sake" (Mat. 24:6-9). Did you notice that? Jesus' own disciples — those who follow Him — "YOU" — are to be delivered up to tribulation, martyrdom! Jesus said that it is "FOR HIS NAME'S SAKE" that the nations would hate you. This could only be referring to believers, not non-believers. Mark records the same warning of Jesus: "And ye shall be hated of all for my name's sake" (Mark 13:13). A martyrdom of Christians! Luke records the same diabolical persecution (Luke 21:12, 17). There is one prime distinction which you need to understand. It is a common teaching today that the "tribulation" is the wrath of God — that the "tribulation" is the same as the "Day of the Lord" — that since God would not vent His wrath upon true Christians, only non-Christians will suffer in the GREAT TRIBULATION. The "tribulation" is the wrath of Satan the devil, the deceiver of the present world. Revelation 12, which we have already read, explains that. Satan has great wrath. He persecutes the true Church! Notice what Jesus said would immediately happen after Satan's wrath — the great tribulation — is cut short: "IMMEDIATELY AFTER the tribulation of those days shall the sun be darkened, and the moon shall not give her light, and the stars shall fall from heaven, and the powers of the heavens shall be shaken" (Mat. 24:29). Here God supernaturally intervenes by supernatural signs in the heavens to cut short the Great Tribulation. "For then shall be GREAT TRIBULATION, such as hath not been from the world's beginning until now, no, nor ever shall be. And except those days had been shortened, no flesh would have been saved (alive from that religious persecution). But for the elect's sake those days" — which other prophecies show would have lasted 7 years — "shall be shortened" — to 3 1/2 years (Rev. 12:6, 14). Notice that in these verses — Matthew 24:21-22 — Jesus calls the final fulfillment of the prophesied martyrdom "The GREAT tribulation." There have been tribulations before. And there is to be a GREAT one in this generation the like of which has never been before. This GREAT tribulation could not have been that of the Middle Ages. God did not shorten that time of tribulation by intervening with supernatural signs. Now what happens when God intervenes to cut short the tribulation? Turn to Joel 2:31: "The sun shall be turned into darkness, arid the moon into blood BEFORE THE GREAT AND TERRIBLE DAY OF THE LORD COME." The "Day of the Lord" is the time God steps into world affairs directly. It is the time of His wrath against those who have persecuted His people. This "Day of the Lord shall come like a thief in the night," wrote Paul under inspiration in I Thes. 5:2. This is not speaking of the coming of Christ, but of the time when God supernaturally intervenes in world affairs shortly before Jesus returns. Compare this with Rev. 6:12, 16-17: "The sun became black as sackcloth of hair, and the whole moon became as blood; and the stars of the heaven fell to the earth... and they said to the mountains and to the rocks, 'Fall upon us, and hide us from the face of the One sitting on the throne, and from the wrath of the Lamb: because the great day of their wrath is come; and who can stand?'" The day of God's wrath will come unexpectedly — like a thief in the night — just as Satan's wrath will soon come upon an unsuspecting English-speaking world in which Christians are being lulled to sleep by religious delusions. How clear, The Tribulation occurs before the "Day of the Lord." They are two different events — two different periods of time! Here is what very few understand. The GREAT tribulation is not the result of internal religious persecution conducted by the English-speaking world on Christians. It is a result of a foreign invasion — a captivity of our English-speaking people in World War III! The Gentile-fascist power that takes us captive will be dominated by a great religious system. That religious-political system will persecute our peoples nationally and martyr those Christians who are not accounted worthy to escape the tribulation. Luke's description in the Moffatt translation makes this very clear: "For sore anguish will come upon the land and wrath on this people" — Satan's wrath on the people of our nations — "they will fall by the edge of the sword, they will be carried prisoners to all nations" — in World War III — "and Jerusalem will be under the heel of the Gentiles TILL the Times of the Gentiles expire" (Luke 21:23-24). It is a time of national captivity — of which the Roman conquest of Judah in 70 A.D. was merely a forerunner. If you have not yet learned our national identity — the proof that our people are included in this prophecy — write today for Mr. Armstrong's free, and revealing booklets "The UNITED STATES and the BRITISH COMMONWEALTH in Prophecy" and "1975 in Prophecy!"' which explain this part of these prophecies fully. Remember that the tribulation is a time of trouble such as has never occurred, nor will it ever occur again. Now turn to Jeremiah 30:4-7: "These are the words which the Lord spoke concerning Israel" — the so-called "lost ten tribes" — and Judah: 'Thus says the Lord: We have heard a cry of panic, of terror, and no peace... Alas! that day is so great there is NONE LIKE IT; it is a time of distress for Jacob'" — a time of Jacob's troubles. Here is also a time of trouble such that no other compares to it. There could not be two different times of persecution each greater than the other. They must be the same time of trouble. The times of Jacob's or Israel's trouble — the national captivity of the English-speaking world — must also be the time of the GREAT tribulation on Christians! The same powers, now secretly plotting in Europe, that have persecuted Christians in ages past are about to emerge as the conquerors of our democratic civilization and of true Christianity! This religious-fascist power is even using our American sponsored Radio Free Europe to promote the last revival of a ten-nation restored Holy Roman Empire! This fact was revealed in "Facts Forum News," March, 1956, page 45! It is time we awaken to what is happening about us! Though Jesus prophesied that Christians would be persecuted in a coming great tribulation, HE ALSO SAID THERE IS A WAY OF ESCAPE! "But watch," said Jesus, "and pray always that ye be accounted worthy to escape all these things that shall come to pass, and to stand before the Son of man." (Luke 21:36). You can escape all the troubles soon to fall on a heedless world — but you must watch world events and pray! Jesus repeated this same promise to His Church today: "Because thou didst keep the word of my patience, I also will keep thee from the hour of trial" — the tribulation and events that follow — "which is to come upon the whole inhabited earth to try them that dwell upon the earth" (Rev. 3:10). But how and where are the Christians who watch and pray going to escape? Turn to the 12th chapter of Revelation. Here we find the answer! "And when the dragon [Saran) saw that he was cast down to the earth, he persecuted the woman" — this is the persecution that is yet in the future, a persecution that is being secretly planned at this very moment! How does the Church escape? "And the two wings of the great eagle were given to the woman that she should fly TO THE WILDERNESS to her place" for 3 1/2 years. The Church is NOT taken to heaven, but to the wilderness — to a desert region here on earth. "And the earth helped the woman" (Rev. 12:13-16). Could anything be plainer? It is time you open your eyes to what's coming. Unless you do, YOU AND MILLIONS WITH YOU ARE PLUNGING STRAIGHT FOR THE MOST FIENDISH, DIABOLICAL TIME OF TORTURE EVER INSTITUTED BY MAN! IT IS NOW BEING PLANNED! There is only one way of escape — "Watch world events and pray constantly."